World of Warcraft is Blizzard Entertainment's massively popular, MMORPG. WoW, as it's commonly called, launched in 2004 in the US (2005 in Europe) and has grown to over 11.5 million subscriber world wide, as of late 2010. There aren't (yet) any specifically-Diablo 3 Easter Eggs in World of Warcraft. 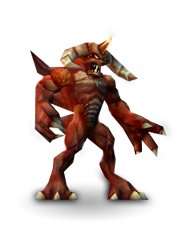 There are, however, a number of Easter Eggs derived from the Diablo series on the whole. The following is quoted from WowWiki.com. This list does not include the dozens of skills, monsters, quests, and other game elements directly derived from Diablo and Diablo 2. An item called the King Cow King's Hide. An item called Wirt's Third Leg. This pet follows, is very cute in a fierce sort of way, and has a fire-breathing "rest" animation. A Tyrael mini-pet was added with a special conversion code given out to attendees to Blizzard's WWI 2008, in Paris. This code enabled the Tyrael mini-pet, who hovers along after the player, and can /dance, when required. This was one of the rarest and most sought-after of all mini-pets at the time, with codes selling for upwards of $800 on eBay. This page was last edited on 17 October 2013, at 07:32.